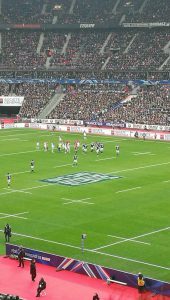 Paris: Watching the Six Nations Rugby and other cultural gems! 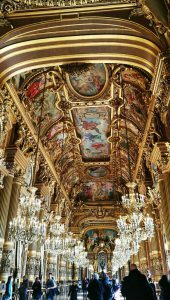 Home > Blog > Watching the Six Nations Rugby in Paris and other cultural gems! Watching the Six Nations Rugby in Paris and other cultural gems! 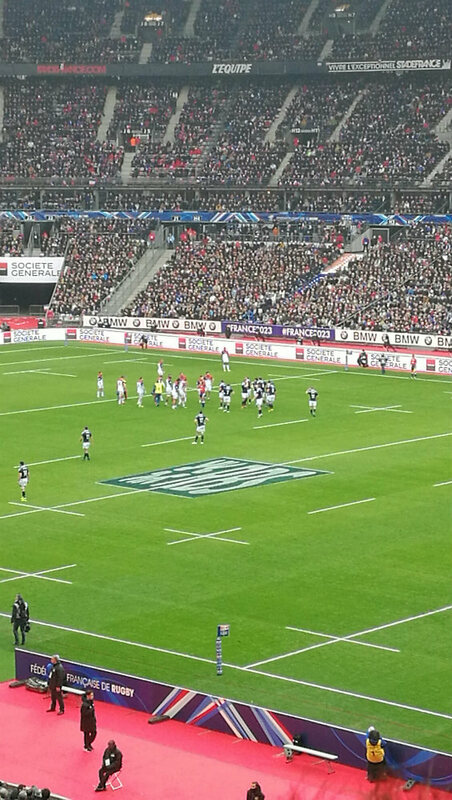 Last Sunday we went to Paris to watch France v Scotland at the Stade de France. We have never seen a big rugby match in person before and were delighted by the atmosphere and sense of goodwill between rival fans. The Scots were in good spirits even though France won. It was a bit odd to be walking around Paris sight-seeing surrounded by exuberant men in kilts! Sport and culture do mix! 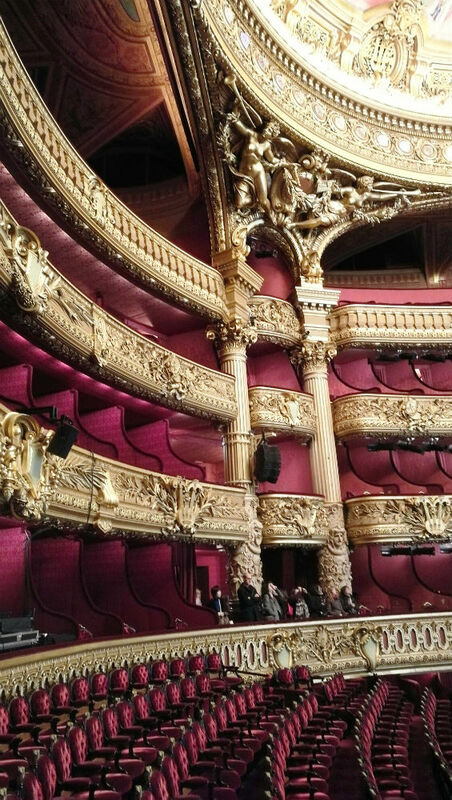 We decided to balance the rugby watching and beer drinking with something a little more cultured so went to explore the Palais Garnier Opera House. What a treasure! It’s like visiting the edited highlights of Versailles or Fontainebleau, with its magnificent double staircase, splendid auditorium, grand forum and truly opulent finishes from bronze to marble. You can follow a guided tour, explore at your own pace with an audio guide or explore with nothing to guide you except curiosity (as we did). 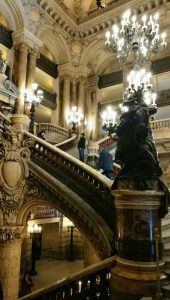 The Opera House was built between 1861 and 1875 for France’s primary opera company, Le Opera de Paris and was used as the setting for Leroux’s famed 1910 novel The Phantom of the Opera, which helped to establish it as one of the world’s most famous opera houses. 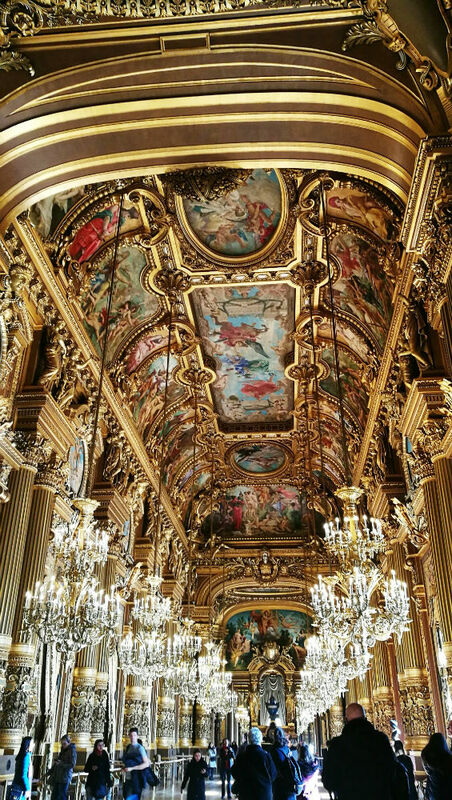 If you are heading to Paris before, during or after your French campervan adventure, take a couple of hours to see this truly lavish edifice in the heart of the capital. After our day of culture and sport (and beer!) we enjoyed supper in another Parisian institution, Brasserie Flo. You’ll be hard to pushed to find a more authentic Parisian brasserie than this and the bill was very reasonable. The service was a bit patchy but not lacking goodwill (as some in Paris do!) and the food was excellent. Do book ahead though or you are unlikely to get a table even on a Sunday night when Paris restaurants are usually quiet. We at stayed at the Best Western Aulivia-Opera Paris, just around the corner from Brasserie Flo. Rooms are very tiny, but it was cosy, perfectly civilised and very good value for Paris at just €89. It’s not the most central location, but a very short walk to the metro which gives you access to any Paris destination. We’d stay there again for a night or two. We live just a 56-minute train ride from central Paris and get to enjoy spontaneous trips like this whenever the mood takes, but we still come away each time saying: “we must do this more often”. Don’t forget to spend a little time in our wonderful capital city during your French trip if you possibly can.